A lot of people dream of owning their own cruising boat and sailing off on endless adventures. And the charm and beauty of the B.C. Coast, with its protected waterways and pristine harbours, only intensifies their dream. Yet most cruising boats, including my own, are used only a small percentage of the time. Their owners’ involvement with jobs, family, and community activities seem to take priority over cruising hither and yon. If you’re considering turning your dream into reality, be aware that owning a cruising boat requires commitment: financial, time, and emotional. In terms of expenses, buying your boat is only the beginning; then comes the cost of maintenance, moorage, insurance, operation, charts, and miscellaneous gizmos that all add up to big bucks. Time-wise, once you own a cruising boat, be prepared to make regular visits to the marina, especially after storms, to ensure she is safe and sound. Routine and unexpected maintenance as well as regular cleaning also require considerable time commitments. The emotional impact is most evident when things go wrong, which happens, according to Murphy, when you least expect it. On the positive side, if you can afford it and have the time, there is a certain amount of pride in boat ownership. Keeping your lady shipshape can be emotionally satisfying, even if you don’t use her as much as you originally intended. One less-expensive alternative to ownership is bareboat chartering, which allows you access to well-maintained yachts in various locations for periods of time compatible with your own schedule. 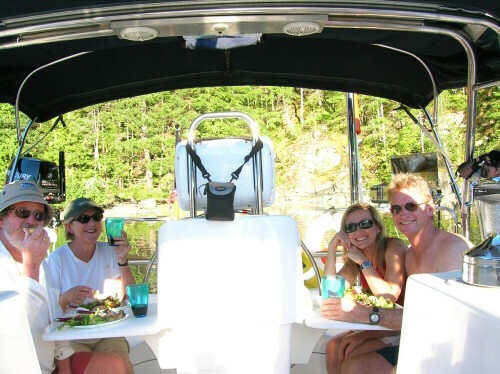 Many seasoned boaters consider the experience of chartering more important than ownership. Back in the early days of chartering, “bare boat” meant “no extras.” Such is not the case today as many charter boats come equipped with all the amenities of home, including microwaves, TV’s, air conditioning and ice makers, as well as all the latest gear such as furling mainsails, power winches, sonar and chart plotters. Typically, the more you pay, the more features your boat will have. Many charter companies have a two-tier system with newer boats in tier one and older boats in tier two, at lower rates. One additional benefit of bareboat chartering is it affords the opportunity to test-drive various models, which will help you determine the type of boat you may want to buy when you’re ready to make the commitments associated with boat ownership. In terms of qualifications to bareboat, you will need basic training in seamanship and navigation as well as experience on a vessel of similar type and size. If the company has doubts about your ability, you may be required to take a captain along for the first day or two of your charter. Instead of being responsible for a yacht, however, you may wish to hire a captain, cook or both, allowing you to just kick back and relax on your “crewed” yacht charter. If you’re feeling a little under-qualified to charter on your own, boating courses and hands-on experience are available through individuals or “full service” charter companies. You may be wondering if there is a difference between chartering and renting. “Not so much,” I would say. When chartering a boat, you are in effect “renting” it for a period of time as specified in the contract with the charter company. However, we usually think of renting smaller boats such as runabouts for a day and chartering larger boats such as yachts for a week or more. Most charter companies require that their yachts be chartered for a week or longer; however, you can in fact rent a yacht for a day, further blurring the distinction between renting and chartering. Perhaps, it really doesn’t matter whether you call it a rental or a charter; the important thing is to have a memorable experience on the water. 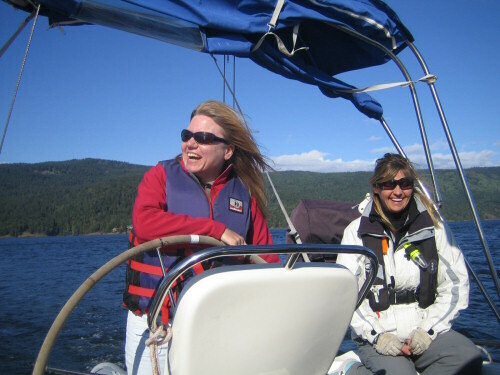 We’re fortunate here on the Coast to have a number of bareboat charter companies strategically located, allowing ready access to popular cruising grounds such as the Gulf or San Juan Islands, Sunshine Coast, Desolation Sound, and beyond. Most of these companies are members of the BC Bareboat Charter Operators Association (www.bcmta.com/bcbca), which requires high operational and ethical standards. By chartering through an Association member, you are assured the company has a valid business license, advertises truthfully, and will provide a prompt refund of your security deposit at the termination of your cruise according to your contract. This full-service company has been helping people create wonderful boating memories for more than 20 years. Blue Pacific staff take pride in providing friendly, personalized service to their bareboat customers, including choosing the right yacht and designing the perfect itinerary. They offer a Yacht Share program for bareboaters wishing to charter for longer periods of time – up to 64 days a year – at reduced rates. The company’s 35 vessels include both sail and power, 27 to 60′, for a wide range of budgets and boaters. Additions to their fleet this year include a new J-32 sailboat as well as several powerboats: a Mainship 40, a Silverton 45 and a Marquis 59. Canada’s largest full-service charter company is celebrating 25 years in business this year. Their bases in three separate locations – Vancouver, Powell River, and Sidney – give customers ready access to the most spectacular cruising areas on the coast. Cooper’s Cruising Club allows substantial savings for boaters who want to charter more than three weeks a year. The company’s 85 vessels include both sail and power, 28 to 60′. Additions to their fleet in 2008 include two new sailboats, a Dufour 36 and 38 as well as two powerboats, a new Coastal Craft 42 and a Westcoast 46. Located in Comox on the doorstep of popular Desolation Sound, this full-service charter company is celebrating 30 years in business this year. Their base is just five minutes from the Comox airport and within walking distance of fine restaurants, grocery stores, and gift shops. The company’s 30 vessels include both sail and power, 25 to 54′. Additions to their fleet this year include two new Beneteaus 32 and 34, a Jeanneau 36 and a Dufour 38. Located in Sidney, close to the Gulf and San Juan Islands, this full-service company also operates a second base in Comox, convenient for its proximity to Desolation Sound. In business for 27 years, Island Cruising is proud to participate in the “Green Fleet Program” whereby only environmentally friendly products are used on their boats. The company’s 40 vessels include both sail and power ranging from 30 to 50′. For 2008, the company has added to their fleet a Mainship 40 powerboat and several sailboats: a Hanse 34, an Island Spirit 40 Catamaran and an Outbound 46 expedition-style boat ideally suited for extended cruising. With excellent ferry and air travel links to the mainland, Nanaimo Yacht Charters is located at the new Stones Marina building, a good jumping off point for cruising both the northern and southern Gulf Islands. “Sail with us” this full-service company says “we’re already there.” In business for 18 years, they offer 33 yachts both power and sail, from 27 to 50′. Additions to their fleet this year include three new Beneteau sailboats, a 42, 48, and 50 as well as a new 39′ Bayliner powerboat.